Windows 8 sets its new Mail app as the default email client. When working on the Desktop on a traditional PC, being bounced into the modern UI is annoying. Windows 8 sets its new Mail app as the default email client. This is annoying when you click an email (MailTo) link on a webpage and you’re bounced into the new UI. 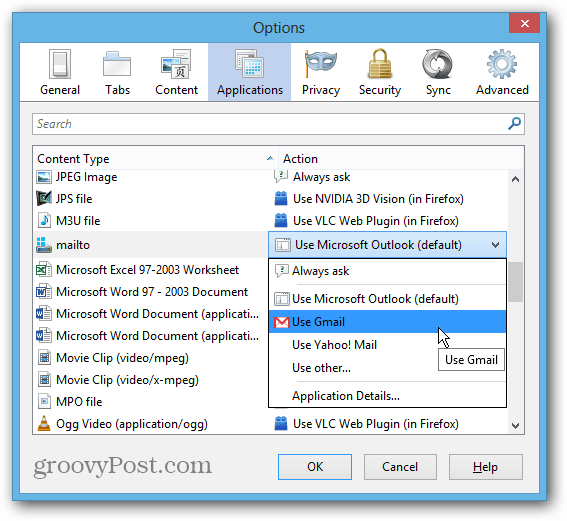 Here’s how to change it to a different desktop email program like Outlook. Changing the default client from the Mail app to something else is similar to making PDFs and Photos open on the Desktop, or preventing videos and music files from opening in Windows 8 apps. Open Control Panel on the Desktop and click Default Programs. Then click “Associate a File Type or Protocol with a Program” link. Next in the Set Associations screen, scroll down the list until you find Protocols, and under that you’ll see MAILTO. It’s set to Mail – double click it. 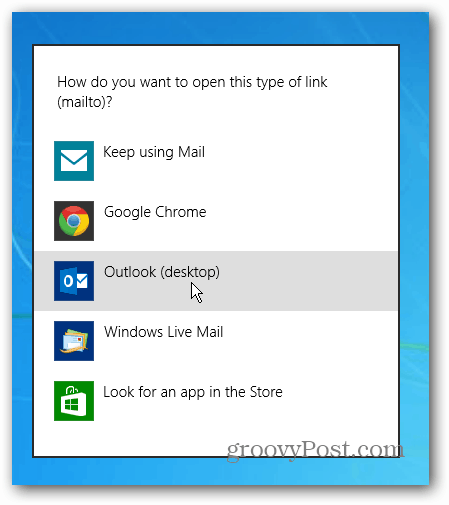 A windows will pop up asking how you want to open the (mailto) link. Select one from the list or check the Windows Store for one. Here I’m sticking with Outlook 2013 for mailto links. Old habits are hard to break! I’ve been using Outlook since 97 and still prefer it today. It’s definitely better than the current version of the Mail app. Using the method above will set your default email for all of your browsers. But you might want to drill down and customize it for each browser, and you can. In Chrome you’ll probably want to set Gmail as your default email handler. 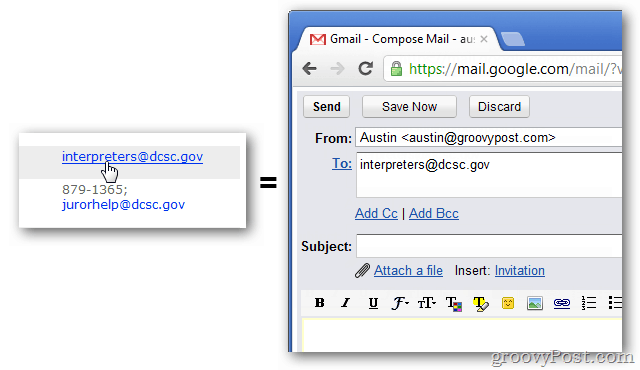 Or if you’re a Firefox user, it’s easy to set the default email client to Gmail or another web based client. Thanks for this article. However, when I open Control Panel–>Default Programs and look at Mailto, the only options are “Mail” and “Search the Store.” I don’t have Google Chrome installed, and would prefer not to install it, as I’m a Firefox user. want to use Gmail via Firefox for Mailto, but I can’t find an answer anywhere online as to how to get Firefox to show up as an option in the list. Any ideas? Thanks for any help you can offer. Craig, go to Firefox Options, Applications, and change mailto: to Gmail. Thanks, Jason. Unfortunately, I’ve already done that and it doesn’t solve my problem. Your suggestion will work for Mailto: links I click on in Firefox, but not globally. For instance, if I click on a MailTo: link in MS Word, or my contact database, it looks for the default option set in Control Panel, and Firefox is not listed as an option there. For now, I’ve had to install Chrome to avoid using the Win8 Mail app for these situations, but it’s not ideal. Perhaps there’s no way to do this without a coding solution by Mozilla or an add-on developer. Thanks for trying to help me out here. I had problems forever trying to get a default mail program that I could use the “send to” option to work for me. Finally I downloaded Windows Live and it became my default and no more problems. You need to have Windows Essentials also. When you request an “uninstall list” and click on Windows Essentials, it give you the option to repair all or any one of the components without uninstalling them. I’ve done that to Windows Live several times. This did not work for me either! I am trying to change Outlook to Chrome (Gmail), but I end up with 2 listings for Outlook and none for Chrome. Very frustrating! Well, I’m upgrading to Windows 7 over Christmas (when hopefully the workload will diminish). I would have done it months ago, but I haven’t had the time and I stupidly held out for v8.1 expecting it would cure all of its predecessor’s ills. It’s slightly less slack-jawed, but still to dumb. I went through your instructions but get to MAILTO and just seen the options of Outlook, Mail and Apps. I already selected Outlook and my Outlook (Outlook 2010) is not recognized. Is there any way to get WIndows 8 to use my Outlook 2010 client? Every time I turn around there is something that does not work correctly or is inaccessible with WIndows 8. I think it is designed to get you to buy all new software. I found the solution on another forum. Go to the Windows Essentials site and download the program. Then go to the Control Panel, Set Defaults, Set Program Access and computer defaults, Custom…..and there will be another option (Windows Live) which is now Outlook. I already had a Live/Outlook account, so you might want to go to Live.com and get one first. After you install it as the default, you can click the Read Mail icon in IE and get a link, and all the previously greyed out “Send link by email” etc. can now be used. Thank you for this suggestion. Got a new computer with Windows 8 for Christmas and am slowly chipping away at getting it to work how I want it to (NOT how some total techie envisioned people would want). This is one small step. Thank you!!! Can anyone help? I signed up on jy hew laptop using my gmail account. My gmail sends and recieves mail just fine. But I cannot send my word documents as attachments and im pretty sure I cant send any attachments. It says I need to associate them. Why I dont know. But whenbi go look for it I dont want to mess anything up and I need to send these word docs so I am loosing it! I already cant use my printer cause its a hp for windows 7 then I go to the ho website and find the download for windows 8 only to get pop ups saying that the file is corupt and cant be downloaded! So just what I need I get a new laptop for school I am doing EMT classes and need my printer and my gmail to send word docs and I cant do either! Anyone with some advise would be really helping me become sane again. Dexter, Had the same problem with my home laptop, took it to best by, they tried loading wordperfect 4.1 (free download Microsoft doesn’t advertise), It did not work my older laptop so I downloaded chrom, this took awhile with help it works. It is cumbersome to use in my opinion but I at least am able to get my documents out. I just set up folder on my desktop and save them there for quick east. Hope this helps. I can’t find the MAILTO icon under protocols. Now what? While the graphics didn’t look exactly like what I had on my Windows 8 Control Panel I was able to follow the gist, make the change, and now email opens in Outlook (13) for me instead of the Windows email. Many thanks for sharing this. It was so nice to actually be able to win a battle for once. thank this- this was incredibly helpful, but I still cannot change the send mail or webcal or few other protocaols and programs away from being outlook, I should simply be able to select calendar from the app store or from my programs to open .hol right? so, when I click on a link on a site and need to send an email that way, it still defaults to outlook for sending mail…. ical doesn’t give an option for calendar….. any suggestions? Thank you. It is helpful. If only we had these options in Windows 8.1. I have tried everything to make Outlook my default or anything that will allow me to click on a photo and have the option to send to an email recipient like in Windows XP. I have Yahoo Mail, AT&T Mail, and Outlook and I keep getting the message “There is no email program associated to perform the requested action. Please install a email program or if one is installed, create an association in the Default Programs control panel. When I go there, click on the icon Mail, it gives no other option to change, correct, add, or delete. Disgusting. Wow… looks like there are many of us sharing the same frustration. I too just bought a computer with Windows 8.1 and am having the same issues with trying to send a picture, receiving the message, “Create an E-mail Association in Default Programs Control Panel.” without luck of it actually changing. I am sure there is a solution out there and hope we can all have this issue resolved soon. Someone? Thanks!! Melanie,this is what I would love to do and have tried to do, but when I click on “Mail To”, it does not list Outlook at all. It only lists, Mail, Google Chrome, or the Store. I do not want Google, and when I go to the Store, everything that has the name Outlook on it, is not the email program and when I type in the search for Outlook Email, it does not come up. I spent a long time on the phone just today with Microsoft, and they did not solve this problem but kept giving the alternatives of how to “Send To”, and that was to forward your photos and files to a mail recipient. I got tired and gave up on the call. From reading other replies above, I see others have the same problem. I cannot imagine why MS does not list Outlook for an option to make it your default. At least it doesn’t on my Windows 8.1.Thank you for you input, however, and I have tried it over and over and does not work for me. action. Please install an email program or if one is installed, create an association on the Default Programs Control Panel. This is what I tried to explain to MS on phone today that I could not use the “send to” option because none of my email programs worked as a default even tho I have tried all the steps as listed above to create an association. As stated, I want Outlook as default but it is not listed as an option. 01.) I did a search on I.E. for Windows Essentials. I then downloaded Windows Essentials 2012. 02.) 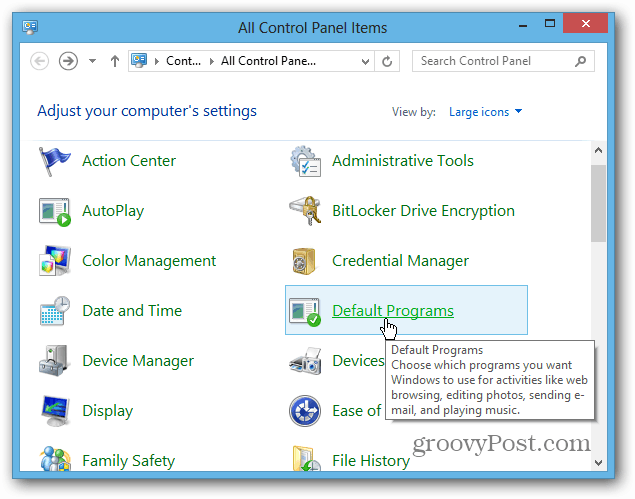 Then went to Start>Control Panel>Programs>Default Programs>Associate a file type or protocol with a program> Double Click on MAILTO> Choose Windows Live Mail. 03.) I have a GMail Account, so went into Tools and made sure that I had enabled IMAP for that account. 06.) The Pictures sent out! It took longer for the recipients to receive them, than before, but they sent. I hope this helps and I hope I didn’t forget something, as I didn’t write everything down as I went, which I wish now I had, so that I don’t misguide anyone in the steps I took. Whew!! Glad you have got this working for you. That is a headway. I plan to go through these steps and see what happens and will let you know. I have noticed on my programs list that I do have Windows Essentials. Thanks so much for all this info. Doesn’t work for me. It is as if I do not have an email program installed. One problem, when I went to IE>Tools>Compatibility View Settings, that required a website address, not an email account. I did add Outlook.com thinking that may make outlook email available but it didn’t. I already had Windows Essentials 2012 listed in my programs, so did not download it again. I can use all 3 of my email programs just fine, but still cannot use the “send to” option. 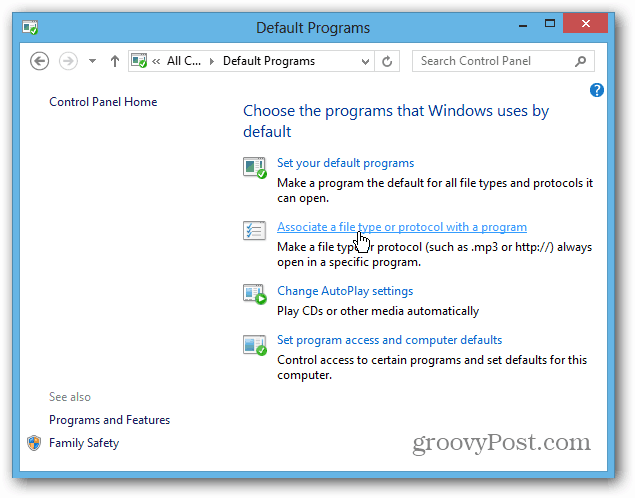 This is the easiest and most simple instructions as to add a default program as I have seen and have tried it many times. My problem is when I go through all the steps and come to the options of the programs, (Mail, Google Chrome, Windows Mail Live, Outlook), my option window shows only three and the one I want, Outlook, is not listed. I don’t know how to get it listed as an option. I use it all the time for my email, but not option to click on and there is no browse option either. I have used the Office repair and that makes no changes. Mail Live and outlook are the same thing now. Click Mail live and see what happens. I have windows 8 and I am trying to set yahoo has my default. I followed the step and when I click on pdf file that I want to email, it brings up outlook 2013. any other suggestions? Yahoo isn’t set up with that capability. It’s independent of Windows. You have to use Outlook/windows live after installing windows essential. I have Yahoo set as my home page, so that I can check it as soon as I open explorer. But you’ll never be able to use it to email outside web page links or pdf files . In my laptop the “People” and “Mail” Apps are pulling up the default account of a temporary user. I am not able to configure my personal accounts to these apps.can someone suggest how I can disable the existing default and enable my intended default accounts? Pay no attention to the article. The solution is in the comments. I’ll repost. Thanks for this!! Worked great!!! How do I put the option of seamonkey into that box that pops up? I think I’m too old to answer that. Never heard of it. haha…. I think you have to use an Outlook email address to send web pages from IE. Other email apps aren’t set up for that capability. Use seamonkey for everything else. I use a private email service. I use Chrome as my browser. I have set the default to Chrome. Still I can’t send mail from any program. I get the the sign: ” Associate a mail protocol ” it demands. You have to select a program in the protocols that it will use everythime. I don’t know anything about chrome, but if you scroll back up to the article, it says there’s a separate protocol for Chrome. If your private email service isn’t on the list to select (to associate) you can’t use it. You’ll have to pick another one. I think they suggest gmail (of course), so just make a gmail account to send links etc. and use your private one for other things. I thank you for your help. I have a windows live email (Hotmail) and had to download windows essentials for it to appear in protocols. I then set up live with my Hotmail account and walaa. it works. I currently have open office which will not link to email but if I use a different format, it works fine. again thanks for your assistance. Lorna, as you can tell from my many previous comments, I really had a problem to establish a default email in order to use the benefits of the “send to ” menu to quickly send photos and documents even though I had windows essentials from day one of Windows 8.1. However, once I downloaded Windows Live Mail, I was able to use it as my default email program immediately. No more problems in that area. You can’t. 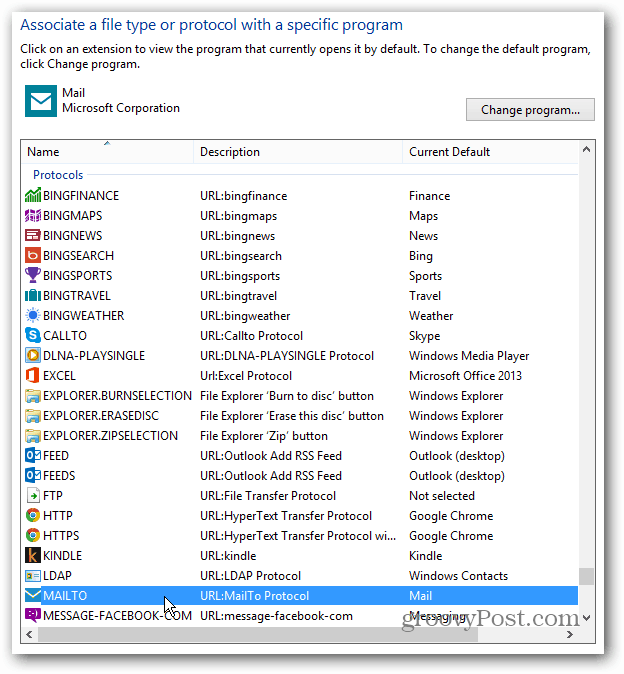 Live/Outlook is the only app that will allow you to send links to web pages, etc. I use Yahoo as my main email, and have that as my home page. But Windows 8 is not set up to have Yahoo as the defult. Could this be the reason that my yahoo email locks ups or runs really slow? I have windows 8 on my laptop and everytime I go and check my email it says yahoo is not responding recover page/or quit, or just freezes up? I thought about going to chrom and still using my yahoo as my email becasue I have had that for years and I don’t want to change that. Soooooo my question is if I do change to chrom will I have to reset all my passwords on everything on my laptop? Will this even work??? I’m not very good with this kinda stuff so I need as much help as I can get, this is very frustrating as sometime it take like 10 or 15 mintues just to send an email or anything, Can someone help me please? Thanks. Thank you for this!!!! I couldn’t figure it out on my own. I want to use OE Classic and Windows 8.1 does not want it. I guess no one has an answer for this scenario? OE Express…. Thanks for the tip. This is just another example of Microsoft being sleazy, sneaky and arrogant with these bait and switch tactics to get you stuck in their products, instead of allowing users to simply choose for themselves. I was going nuts this am trying to use a link online to bring up a NEW email form to send to the site I was at…using miserable WIN8–boohiss. I finally got my windows live mail preference to launch from the link click, but no new “preaddressed” email form appeared. I sort of went thru things kind of backward as it happens. I use Firefox so I went to OPTIONS and found the “mailto” under applications…but NO live mail was listed so I somehow used “use other” and “application details/browse” and found my live mail application on my C drive and entered it. That brought up live mail instead of the stupid win8 mail app which doesn’t support my POP3, and I’m used to live mail anyway and try my BEST to avoid win8’s silly app frenzy…but I still got NO new mail form! A bunch of searching later, I found the instructions for changing defaults on my computer AND in Firefox and then went BACK to OPTIONS/Applications/MailTo…and NOW there was a different looking icon for Windows Live Mail so I selected that and now it WORKS! New preaddressed email form to use. As further advice, I used the instructions above to set defaults for BOTH of the top 2 “categories” listed in the window…the top one set my default for my computer and the 2nd set the default for my MAILTO…that step was ALSO a biggie. I hope I got everything here…and thanks for the helpful steps here. Welcome to the other side! You fought well…. And you’re such a ……..droonfang……..I’ve been alerted for the last couple of years every time someone posts, and I am so amazed that people still find this old thread, that they read the comments (because that’s where the real answers are) and that Windows 8 is still a piece of crap and hasn’t fixed this yet (still the same for 8.1). Plus you actually put in new information! It will be here forever….. I didn’t read all the comments, but I had two choices when trying to install default email in Win 8.1. Look for an app in the Store. when you click on a link for email, copy & paste the target email address into Gmail, and send it from Chrome. You cannot configure Windows 8.1 to accept ANYTHING except Outlook (which I never use). 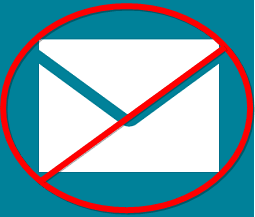 As in most things in Windows 8.1, there seems to be no alternative to using an MS product unless it is in the “Microsoft Store.” So if you are using well liked email program, forget it!